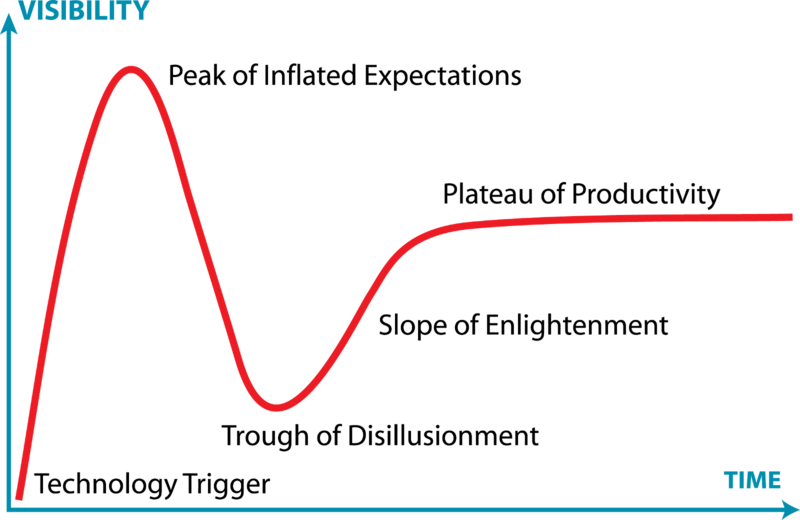 As with every general hype cycle we’ve sped past “peak mindfulness” and are well into the trough of disillusionment. As we exit the trough be prepared to see 2nd generation iterations of mindfulness emerge. One way to look at the development of the global mindfulness movement is to transpose another model — the “general hype cycle for technology” — onto mindfulness. The resulting transposition tells a new story about how mindfulness has developed and where it might be going. The mindfulness movement includes a matrix of practices, ideas, & customs which have been unbundled, primarily from modern Buddhist meditative traditions, though also from early Western thought, and remixed with secular humanist ethics, yoga training, and modern science. This unbundling started a while ago, going back to Asian Buddhist teachers in the 19th and 20th centuries, but it found its breakout remix in the form of the Mindfulness-Based Stress Reduction (MBSR) program. Developed by Jon Kabat-Zinn & others MBSR offers a health-based adaptation of mindfulness training and has remixed it with other methods, into a successful treatment protocol. The unanticipated result of this innovation has been a growing acceptance of mindfulness as a valid field of scientific research and a massive explosion of research on mindfulness & meditation (i.e the 1st generation of mindfulness). We probably hit peak mindfulness in the United States sometime in 2015. Mindfulness meditation cures all problems, was the story we were hearing almost constantly! It’s what us stressed out knowledge workers need in the new attention economy. It soothes all pains. Peak mindfulness is driven by the understanding of mindfulness as a panacea to our modern ailments. We ❤️ cure-alls don’t we? But for those of us who’d been behind the scenes and seeing the formation of mindfulness and it’s slow differentiation from modern Buddhism, many of us reached peak mindfulness further back still. 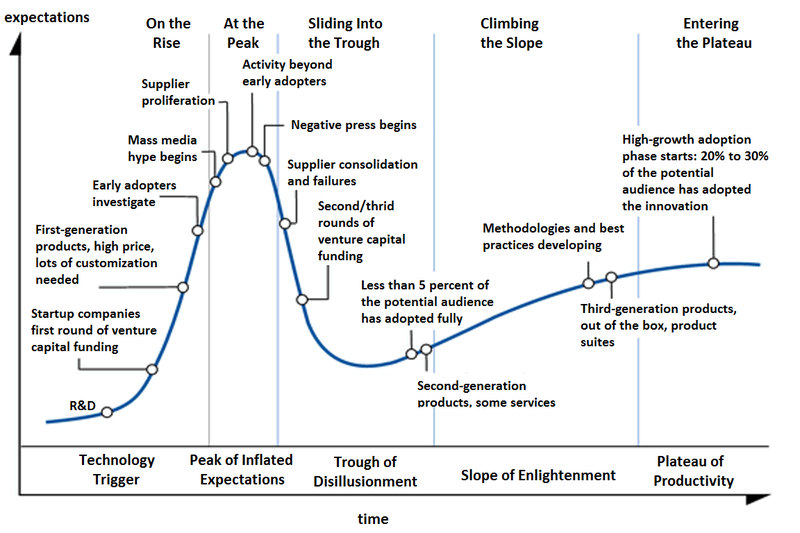 While most people were peaking we were well into the trough of disillusionment. I remember hearing the term “McMindfulness” for the 1st time at an LA-based conference I helped host in 2011, called The Buddhist Geeks Conference. At that event, and over 3 others, we collectively explored the shadow sides of mindfulness and it’s powerful entry into global life. We talked not just about the positive, but also the blind sides of the emerging science around mindfulness. We looked at the downsides of not sharing the full range of potential side effects that could impact mindfulness practitioners, as well as the lack of well-trained teachers in a quickly growing field. We also considered the socioeconomic pitfalls of mindfulness melding with global capitalism. Fast forward to 2017 and we can see the blow-back of peak mindfulness (see here, here, here, here, & here) starting to pick up. Mindfulness is on the defensive — a key indicator that it has entered the trough! People who believe in the good word of mindfulness are staking out their positions and digging in. And those people who are sick and tired of mindfulness —many of whom are jealous that their ideas aren’t getting nearly as much attention — are coming out in droves to tear it apart. And while many people have yet to Yo-Yo through the peak & trough of mindfulness it’s interesting to note that for those of us who have become disillusioned with mindfulness already, many of us are starting to reimagine mindfulness as an imperfect tradition which can incorporate its criticisms and evolve in response to the most valid points. We are The Second Generation of Mindfulness, slowly climbing the slope of enlightenment. We aren’t close to there yet, but it’s good not to be at rock bottom anymore! The next generation of mindfulness, like the next generation of anything, is a response to the previous one. Where our parents were hopelessly idealistic in certain ways, we’ve learned to temper that idealism and focus on practical realities (while obviously developing new forms of idealism). Where our parents were conservative regarding certain possibilities, we’re much more experimental, less beholden to tradition (and thus make more missteps and mistakes). The second generation of mindfulness is just starting to emerge and take form. And it isn’t our parents mindfulness. It’s an adolescent just starting to find it’s own voice. I’d like to propose that this latest generation of the mindfulness movement will be led primarily by a new group of teachers & leaders, by newly imagined communities, and that it’ll be driven by new technological innovations and orienting philosophies. It will also be deeply connected to social & technological concerns, increasingly social in its practical application, highly innovative in its use of technology, increasingly human-centric, breaking free into new areas of scientific research, cur the current secular vs. religious distinction, and more critical of late-stage capitalism/democracy. I also expect that this second generation of mindfulness will continue to remain unbundled and remixable, but that the people remixing it — especially in a Post-Truth-Trump era — will increasingly focus on the underlying ethics of its application. While mindfulness can be easily adapted to many different ethical frameworks, how it’s taught and where it’s taught is still very much being driven by the ethical actions of its proponents. In a follow-up to this I’d like to explore more of the contours of this next generation and what it’s starting to churn out.